Charleroi Borough is located along the Monongahela River in Washington County, 25 miles south of Pittsburgh. Charleroi, an industrial town that revolved around the manufacturing of glass, incorporated in 1891. At that time glass was in a high demand and Charleroi thrived. The Charleroi Plate Glass Company’s plant at the time was one of the largest glass plants in the country. In the following years, Charleroi played a key role in the country’s industrial era helping to fuel it with glass production. With this growing population came a need for retail in Charleroi and what started off as a means to accommodate the workers and their families, thrived into a massive commercial district that turned Charleroi into a popular Mid-Mon Valley area shopping center. Many of the original commercial buildings remain giving Charleroi an amazingly intact historic district. Charleroi still has affordable housing opportunities and an active downtown with many businesses who prosper and call the Historic community home. Charleroi hosts many events annually including an Easter Egg Hunt, Farmers Market Community Day, Little Great Race, Movie Nights, Halloween Downtown & Parade, Santa Arrival Festivities and other events. 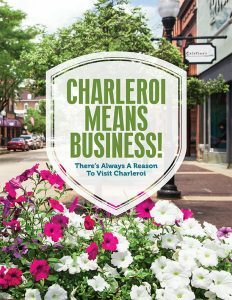 Dates and times of events can be found at the Borough web site, www.charleroiboro.org, http://charleroimeansbusiness.com/ or on their facebook page. In addition, our Historic Downtown Area is home to 8 restaurants various stores and shops plus more than 100 other various businesses. Three parks with a variety of assets, including a riverfront “Trustees Park” are available to residents and visitors. The neighborhood parks are at Second St. and Woodland Ave. and Seventh St. and Crest Ave. They offer basketball, playgrounds and picnic tables and pavilions. The “Trustees Park” is located along the Monongahela River and boasts a beautiful view of Lock #4. With three baseball fields, two pavilions and a playground area the site is very active in the summer months. Charleroi’s flat terrain in Downtown makes it a favorite walking and running spot for locals and visitors. Charleroi Borough is undergoing a process to revive the Second St. River Access ramp and develop a strategy for improving facilities along our entire riverfront. Currently river access is nearby at the state access site in Lower Speers.